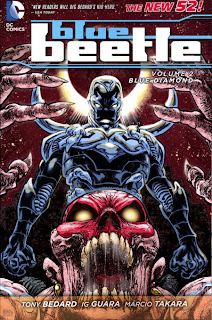 Writer Tony Bedard follows up his good New 52 Blue Beetle debut with an enjoyable sequel, Blue Beetle Vol. 2: Blue Diamond. The massive eleven-issue trade starts slowly, but picks up steam as it goes along, and if nothing else whet my appetite for the short-lived Threshold series that follows this, Blue Beetle's last collection. The first two chapters of Blue Diamond are the weakest, though they represent well why the book gets stronger from there. In these, Blue Beetle Jaime Reyes has run away to New York so as to keep his scarab powers from further harming his family. There, he encounters a shelter for runaways where new villain Stopwatch uses the runaways to commit crimes. Stopwatch is a rather silly, one-note villain, and despite that the story reflected Jaime's time in New York, it didn't have much to do with him as a character; any number of heroes could have easily fit the same role. Fortunately, Blue Beetle improves consistently after that. Bedard spends the next couple issues on team-ups, bringing Jaime more fully into the new DC Universe. He meets Green Lantern Kyle Rayner and some of the New Guardians (a team that brings a smile to my face despite myself), runs afoul of Director Bones and the DEO, and then has a dust-up with Booster Gold, which is a nice twist on the old Blue and Gold friendship. These stories each consist of more than just hero versus villain, and also reintroduce Jaime's friends and family to the story. Whereas the first two issues of this collection didn't tie much to Jaime himself, the space adventure is all about Jaime and his scarab; two of his main antagonists, Lady Styx and Sky Witness, are both former hosts of Jaime's scarab. Jaime also re-encounters Khaji-Ka, another scarab who'd been hunting him, now turned ally. The space trip itself is a lot of fun; Bedard puts a bunch of sci-fi cliches to good use with a hijacked space ship and an alien cantina. Though Ig Guara and Marcio Takara handle most of the art duties, Scott McDaniel contributes an issue to the space story; after a disappointing run on Static Shock, McDaniel's art is nicely clear and energetic here. I appreciated Bedard's Beetle-centric origin for Lady Styx, who in the old DC Universe was just a stock, origin-less space baddie. Throughout the story, Bedard stays true to the core of Jaime Reyes, a well-intentioned teenager thrust into a situation outside his control; I appreciated, for instance, that even though Sky Witness tries to kill him, Jaime still takes pity on Sky Witness and tries to recruit him as an ally later on. Bedard also ends Blue Beetle on just the right note, with a heartfelt message sent across the stars by Jaime to his family; Jaime's family, the core of the series, comes back around at the end. At first the premise of Threshold, Keith Giffen's new series about a cosmic reality series where Lady Styx hunts the contestants, sounded hokey to me. Between Bedard's Lady Styx origin and his depiction of the show's sensationalism (a nice parallel to the Superfail website that hounds Jaime in the early chapters), I'm a bit more convinced. Blue Diamond ends on a good cliffhanger, and since Giffen and John Rogers wrote the original (and still best) adventures of Blue Beetle, the sole Threshold trade just got bumped a little higher on my list. Blue Beetle Vol. 2: Blue Diamond is a pretty basic superhero story, nothing to stretch your brain but still plenty entertaining. I give DC points for shoving eleven issues in here without the paper feeling thin nor the covers curling as is sometimes a problem (though there's a lot of text that's difficult to read so close to the spine inside). For, let's say, a long airplane ride or a car trip, Blue Diamond's not a bad book to take along. 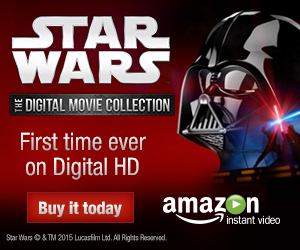 Next week, a little Aquaman, a little Star Wars. See you then! This was one of the series that I was most disappointed to see canceled. Between this and the earlier cancellation of the Giffen/Rogers pre-New 52 Blue Beetle-series, I guess there's a pretty clear message that there just isn't a big enough fanbase to support a monthly series (or at least one that isn't written by a superstar writer like Scott Snyder or Geoff Johns who can sell issues on their name alone). It's a shame because I think that Jaime Reyes is probably one of the best new characters from the past decade. A coda that, having now read the New Guardians "half" of this crossover, it makes sense that it was not included here; the New Guardians appear in the Blue Beetle issue, but Blue Beetle does not appear in the New Guardians issue, only separate Reach characters, and including those one or two New Guardians issues would have significantly affected the flow of this book. Blue Beetle volume 1 is kind of establishing the idea of Blue as the hero of El Paso, complete with actual super villain (god i miss super villains in the NU52), but this volume threw all that away for no return on the investment. We where smack bang in the middle of the "establishing phase" of the narrative & the writers just up and decided "nah, lets go to new york, then space & spend 11 issues not telling a story." The establishing phase is the most important phase of any new title, even more important when its a solo book & its a relatively new, untested property. So why this book decided to up & jump the shark so immediately is not just counter intuitive but just down right self defeating. Appreciate your chiming in on this one, Matt. I can see your point that maybe the Blue Beetle title needed to spend more time in El Paso, but I actually liked the shift to New York and space in part because it helped differentiate this series from the Blue Beetle series that immediately preceded it. That book did take place almost completely in and around El Paso, and I'm not sure Bedard could have done anything new with the book treading that old ground. Either way, I thought this book went out on a high note, and I'm eager to see them use Blue Beetle again somewhere. A digital-first miniseries, maybe?